I found an old copy of Anne of Avonlea a few weeks ago and decided to re-read it. I've never liked this cover because of all the PINK and hello, we all know that Anne never wore pink because of her red hair. She used to say that when she got to heaven, she'd finally wear pink. I always thought that was so sad and decided that life was too short to not wear pink if you liked pink. So my daughters with reddish hair and freckles wore all the pink they wanted. I had kept the book because we bought it when Stirland Lake High School was closing, back in 1992 or so, and then we loaned it to the school library at Round Lake. But it is time to say goodbye, because even with lots of packing tape it's falling apart, so I read it one last time. And I am more impressed than ever with Lucy Maud Montgomery. For one thing, Lucy Maud somehow wrote wonderful fiction while raising a family, running a house, and being a pastor's wife. People said she would often be muttering dialogue to herself as she marched down the street to the post office or the butcher. I had a recent conversation on Facebook about how much I resent women [such as Ann Voskamp and Ree Drummond] whose lives have many similarities to mine but whose writing success has been astronomically more. But Lucy Maud doesn't rouse the same resentment. I think I would have liked her a lot. While you are psychoanalyzing that, I will go on to say that once again, I loved how she creates so many memorable characters, and she makes such insightful and funny observations about life through her characters' voices. In Anne of Avonlea, she talks a lot about singleness. "Then I shall die an old maid," was the cheerful response. "I daresay it isn't the hardest death by any means." "Oh, I suppose the dying would be easy enough; it's the living an old maid I shouldn't like," said Diana. "I don't see that Anne needs any more education. She'll probably be marryng Gilbert Blythe, if his infatuation for her lasts til he gets through college, and what good will Latin and Greek do her then? If they taught you at college how to manage a man there might be some sense in her going." "Why don't YOU get married, Marilla? I want to know." …she answered amiably…that she supposed it was because nobody would have her. "But maybe you never asked anybody to have you," protested Davy. "Oh, Davy," said Dora primly, shocked into speaking without being spoken to, "it's the MEN that have to do the asking." "I don't know why they have to do it ALWAYS," grumbled Davy. "Seems to me everything's put on the men in this world." "I'm really a very happy, contented little person in spite of my broken heart. My heart did break, if ever a heart did, when I realized that Stephen Irving was not coming back. But, Anne, a broken heart in real life isn't half as dreadful as it is in books. It's a good deal like a bad tooth…though you won't think THAT a very romantic simile. It takes spells of aching and gives you a sleepless night now and then, but between times it lets you enjoy life and dreams and echoes and peanut candy as if there were nothing the matter with it." Lucy Maud had a few broken romances before she married at age 37, so I would think she had plenty of conclusions about singleness. "I hope they won't call Mr. Baxter from East Grafton here, anyhow," said Anne decidedly. "He wants the call but he does preach such gloomy sermons. Mr. Bell says he's a minister of the old school, but Mrs. Lynde says there's nothing whatever the matter with him but indigestion. His wife isn't a very good cook, it seems, and Mrs. Lynde says that when a man has to eat sour bread two weeks out of three his theology is bound to get a kink in it somewhere…"
Mrs. Lynde is certainly the character that says out loud what everyone else is thinking. …"Dora is a lovely child, although she is…kind of…well, kind of …"
"Monotonous? Exactly," supplied Mrs. Rachel. "Like a book where every page is the same, that's what. Dora will make a good reliable woman but she'll never set the pond on fire." It's interesting to see Rachel Lynde's progression through the books. In the first one, we hate her along with Anne when she disparages Anne's red hair and her looks in general and then her temper. But the interesting thing about LMM's skill is that her characters are a mix of good and bad, and she has very few characters that are entirely one or the other. Which is much more real life than many characters in today's novels that have either no flaws or no redeeming factors. Marilla recognizes this duality when she floats the idea of Rachel Lynde moving in so Anne can go to college. "She says she'll have to go and live with Eliza and it's breaking her heart to think of leaving Avonlea. A woman of her age doesn't make new friends and interests easy. . . . the thought came to me that I would ask her to come and live with me. . ."
"Do you think...are you sure...you would like it? Mrs. Lynde is a good woman and a kind neighbor, but...but..."
"But she's got her faults, you mean to say? Well, she has, of course, but I think I'd rather put up with far worse faults than see Rachel go away from Avonlea. . . I think it could be managed so that Rachel and I wouldn't clash at all. . . she could have the north gable for a bedroom and the spare room for her kitchen as well as not. . ."
I love that mixture of bluntness and consideration, and even though it came from Marilla you know it was actually Lucy Maud putting words in her mouth. I'm sure there was much she couldn't say, especially with being a minister's wife, and this was a sly but acceptable way of saying these things out loud. I wish I could have met Lucy Maud Montgomery and had a conversation over tea. Successful or not, I'm pretty sure I would have liked her a lot. Love the L.M Montgomery books; the Golden Road, the Blue Castle,Tangled Web,Jane of Lantern Hill, the Emily books and all the Anne books. I'm sure Dorcas, that you and LM would have a wonderful conversation over a hot cup of tea. Heather from Australia. PS Love your blog. Thanks for coming by! I think A Tangled Web is my favorite. I have loved L.M. Montgomery's books ever since I received Anne of Green Gables as a gift from my aunt at somewhere around age 11. I've read the Anne series many times and still love them. You are so right about her characters. However, about a year ago, I re-read the Emily series for the first time in a number of years. My jaw nearly hit the floor at the relationship between Emily and Dean Priest. It was nauseating. I know I read it as a person who lives in the 21st century. BUT! I felt it so inappropriate that I got rid of at least the last two books, maybe all of them, I can't remember. I should really read about Montgomery herself. You intrigue me with bits of her story. Someday I want to visit P.E.I. Yes to your impressions of Dean Priest. He always seemed like a creepy predator and I wonder if there was a real-life parallel in LMM's youth. I just read her bio. She definitely could have used a cup of tea with you! I've always loved the Anne books and read most, if not all of the other books by L. M. Montgomery. I never knew about Montgomery's life until recently. Absolutely not an author your young child should choose to research! Her childhood and adulthood was lonely. Her mother died, her father abandoned her, she had an affair with the married man she worked for, and later married a man she didn't love who turned out to be mentally ill most of his life. I think she thought that her hard life was a punishment for the affair. Reading about her life explained so much about her books particularly the strange parts. Yes. One of my daughters read her published journals recently. So sad. She was so alone in the world. When she first received publishing success she had no one to be happy with her. I have never read Anne of Avonlea but have read Anne of Green Gables. I would read portions of it to my girls at bedtime. I wonder if I could find Anne of Avonlea somewhere. I still have Green Gables and it's pretty beat up. I think when I'm done with all my book review obligations,I will read it again. I probably already mentioned this to you, but we named our youngest after Anne of Avonlea, though we spell it differently. I love your thoughts here, and have often felt similarly. 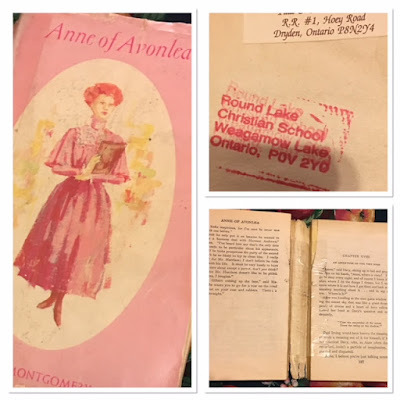 Crystal, I wanted to name our oldest Avonlea but my husband was thrilled with the name and was concerned Avonlea would always be mispronounced. Not sure I knew that, Crystal. It is a beautiful name, however it's spelled. Yep. Definitely some of my favorite books! I had a friend who acted Anne in a play & would go around reciting lines till I felt like it was actually her, & maybe I was Dianna! I love Montgomery's writing. Like you mentioned, the characters (especially in the Anne series) are so believable, which I think is the beauty of her work. Thanks for writing this. It was fun to hear your perspective! L. M. Montgomery is an author I have reread so many times. She's like comfort food. The Blue Castle is my favorite out of all her books. As much as I love the book, though, I admit most of Valancy's relatives don't follow the rule of having a mix of good and bad. They are pretty one dimensional- all bad! :D But it makes a very entertaining read, and lets you feel good about the decisions Valancy makes in the book. That's who I was thinking of when I put in that qualifier--"very few" that are entirely one or the other. And yes, the Blue Castle is very much comfort food. it seems reading the "Anne" books are a rite of passage for girls becoming women. I'm 45 (I think?) and I still can enjoy some of them ;) My oldest girls loved the books and now my younger one is getting to that age as well... memories! I love the Anne books. I've loved them most of my life, and just recently, finally, read through the series with my daughters and had the privilege of introducing them to that world as well. I love how so much wisdom and truth about daily life in general are imparted in those pages, along with Anne and all her Anneish-ness.